The Sierra Leonean woman pictured is a victim of the rebel war now dubbed "blood diamond warfare." 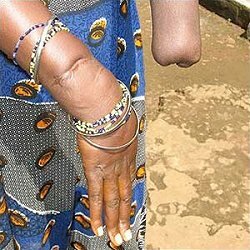 She very likely remains in an amputee camp, without a future and livelihood and where basic necessities of life provided partly by the UNHCR hardly reach individuals like her. With mass poverty and monumental needs in the country, she's just one of hundreds of amputees, including children and babies. Their needs are many and the government is too engaged in other activities that make their welfare a backburner priority. The rebels cut off my hand on Jan. 22, 1999 in the capital, Freetown. I heard the rebels were coming and tried to hide in a building but they caught me. They put my left hand on a table and chopped it off with a machete. I begged for mercy and asked them to think of God. They told me to point to God with my right hand and they tried to chop that off, too. They tried three times but could not cut it off. But I cannot use three of my fingers on my right hand.